Seed Starting: Which Plants Should You Start Indoors? | Gardens Alive! A. Well, the first thing I want to do is urge you to slow down your timing a little—April 1st seems awfully early to plant summer veggies anywhere in Virginia; and new gardeners often misunderstand that "the last average frost date" simply means that the odds are good it won't drop below 32° F. after that date. It still CAN drop below freezing. And summer plants like tomatoes, peppers and cukes despise nighttime temps below 50°. So think of your April's Fools date as more an omen—and a good time to put starts of cool-weather lovers like lettuce and pansies in the ground. Wait until nighttime temps are reliably in the 50s for the Boys of Summer to go out and play. Now, your question is especially welcome as this is a major slip-through-the-cracks topic in the world of gardening advice: Very important but seldom covered—an issue we will now remedy. Let's do this by the seasons. Many of our favorite crops need to grow in cool weather, and will burn up or turn bitter in the summer heat. 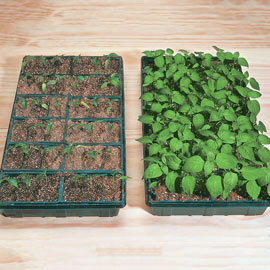 But their seeds won't germinate in the cold soils of April and May, which are key growing times for the plants. 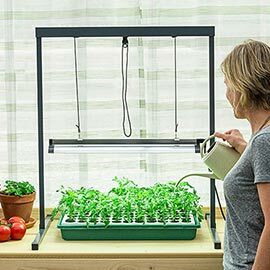 So your first runs of lettuce and spinach should be started inside (or purchased), and then transplanted outside as soon as the soil can be worked. But later runs can—and should—be started directly outdoors, as soon as the soil is warm enough to germinate the seed. Broccoli is also typically started indoors, so it can be transplanted out with enough growing time to develop a nice sized head before the weather gets hot and those little buds open up, giving you pretty yellow flowers and inedible broccoli. Cut the heads off while they're still tightly closed and enjoy them before hot weather arrives, but leave the plants in the ground; they'll produce lots of tasty side shoots (small heads that sprout all over the plant) in the Fall. The timing of peas is especially tricky in areas where cold winters quickly morph into hot summers. It typically takes pea plants about 60 to 70 days to produce their first pods, so in my clime, if you wait until the soil is warm enough to germinate this typically 'direct sown' crop, you have a very short pea-picking season. That's why I pre-sprout the big seeds indoors or start them in peat pots. Then I can plant the sprouted peas or pots outdoors, where the plants will thrive in the same cool weather that would have prevented the seeds from sprouting. This is a good place to explain that the 'days to maturity' number on seed packets practically demands that you know whether the plants are generally started indoors or 'direct sown' in garden soil. For historically direct-sown crops like peas, beans, corn and lettuces, 'days to maturity' refers to the number of days from your planting the seed in warm soil to the first run of pickable food. But with traditionally pre-started crops, it refers to the number of days after you put six week old starts in the ground. So when you see a tomato rated at 65 days, that's 65 days in the ground, plus six weeks of plant growing inside first, plus a week for the seeds to germinate in the beginning. So that '65 day tomato' really takes about 115 days from when you plant the seed until you can expect to pick the first fruits. Crops that are typically direct-sown are generally grown in rows or clusters rather than as individual plants—this includes salad greens, carrots, peas ,beans and corn. In extreme climates with a very short season, people will sometimes pre-sprout their beans and corn to make sure they have enough growing days, but most of us can just sow them where we want them to grow after the soil gets good and warm. 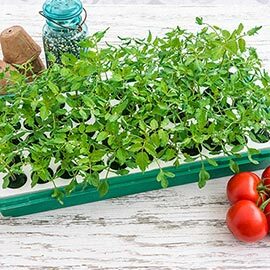 The classics for indoor starting are the crops that are typically grown singly and take a fairly long time to go from seed to dinner plate companion, like tomatoes,peppers, eggplant, cucumbers, melons and winter squash. Summer squash like zucchini can go either way; the growth is so rapid that many people just plant the seeds outdoors after the soil warms up—but you can start them inside if you like. And finally, none of this is meant to make seed-starting sound easy. It is not. It IS very rewarding, but it is not easy for beginners to master; and it is a completely different skill than outdoor gardening that requires special equipment, attention and patience. Don't try and cut corners on things like soil-free mix and bright artificial light. You'll probably still have some misadventures your first time out, but pay attention, follow the directions and you'll soon be a pro (and able to grow any darn variety you want!). But if it seems like too much work to do it right, or you're going to insist on using things like garden soil, egg cartons and a cold dark window, buy plants that have been started by pros.